The look of the new uniforms was of a Tennessee Zouaves. Jackets and pants were Confederate gray, with a scarlet line running down the seems of each pant leg.The hats was gray with scarlet trim and the linning of the jackets as well as the soldier's shirt of scarlet color. Officers had crimson and gold trimming on the jackets sleeves. After dreadful event of Fort Henry and Fort Donelson, the one who were captured and sent to prison evetually were parolled and were sent to be re-organized. 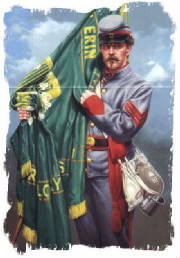 The enlisted men meet up with Col. McGavock who was wearing a new customed tailored gray and red uniform and waving a green ribbon from the red band on his hat. For every body else it is unclear its assume that the men aqquired the regular Army of the Tennessee uniforms. Columbus Depot Jacket, which was butternut in color; also having butternut trousers. The original colors of the 10th Tennessee never made it past Fort Donelson. At the surrender of Fort Donelson the flag was folded up and basically handed to the Union capturers it place on a bed. The description of the flag is well known, green with a large golden harp in the middle. White clovers wrapped around the harp. 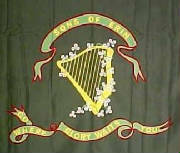 The above banner states "Sons of Erin and the bottom banner states "Where Glory Waits You".